The Simmons BeautySleep Infant and Toddler Mattress offers the ideal firmness for infants on one side and convoluted comfort for toddlers on the other. It works well with cribs that convert into a toddler bed. The Simmons Slumber Sky 2 in 1 Infant Mattress M58983-2014 has many exciting features for users of all types. See the Simmons Slumber Sky 2 in 1 Infant Mattress M58983-2014 gallery images above for more product views. 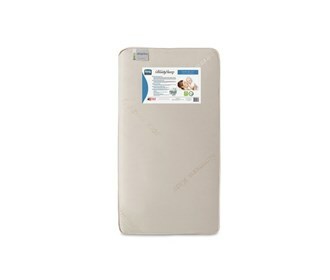 The Simmons Slumber Sky 2 in 1 Infant Mattress M58983-2014 is sold as a Brand New Unopened Item.